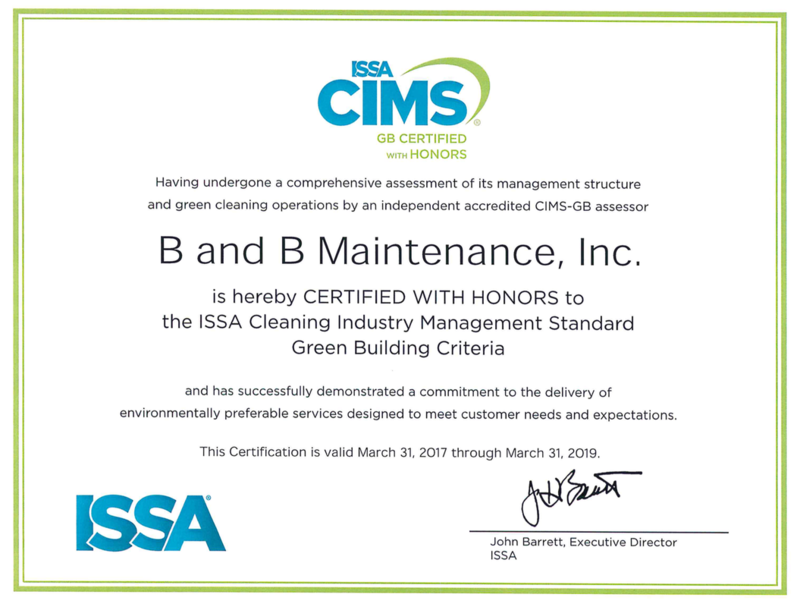 CIMS and CIMS-GB - B AND B MAINTENANCE, INC.
What is CIMS and CIMS-GB? 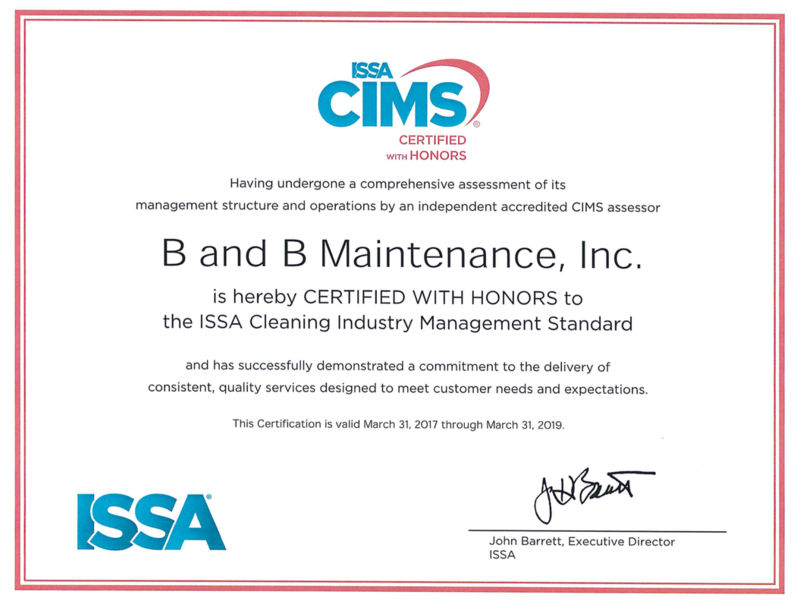 The CIMS and CIMS-GB Standards were developed by the ISSA to assist facility service providers in developing customer-centered organizations. These standards are accredited by an independent, third-party assessor to ensure satisfaction is met both in paperwork as well as field interaction. Our clients can rest assured that they are receiving the highest level of facility maintenance as well as being delivered consistency to all of their locations across the United States. ​Our clients deserve the high quality that we can offer. With constant communication, rigorous site inspections, continuous improvement, and customer evaluations, we can ensure this is met. ​Human Resources at B and B Maintenance, Inc. is a demanding task. From initial employment, to health insurance, to even employee relations, B and B Maintenance, Inc. treats all staff with respect. ​Management plays a major role in the operations for B and B Maintenance, Inc. Keep all staff levels on the same communication line will increase productivity and employee morale. ​Because you can't be successful without a plan in place​. By providing our clients with a standardize approach we can say the necessary tasks are being completed professionally. ​Eliminating and controlling job site hazards is and will continue to be B and B Maintenance, Inc.'s number one priority for our staff as well as our clients. ​By using best practices, sustainable equipment and cleaning products, as well as documenting our results, we can successfully assist in any LEED and/or Green Building certifications for our clients. Certification indicates that an organization conforms to the requirements set forth in the standard and has successfully demonstrated compliance to an independent, accredited assessor. After the initial application is accepted, the ISSA assigns a third-party assessor to perform audits on various client jobsites. This assessor reviews documentation, programs, and follows up with job site visits to ensure these practices are being performed. Want to learn more about CIMS, CIMS-GB, and the ISSA?